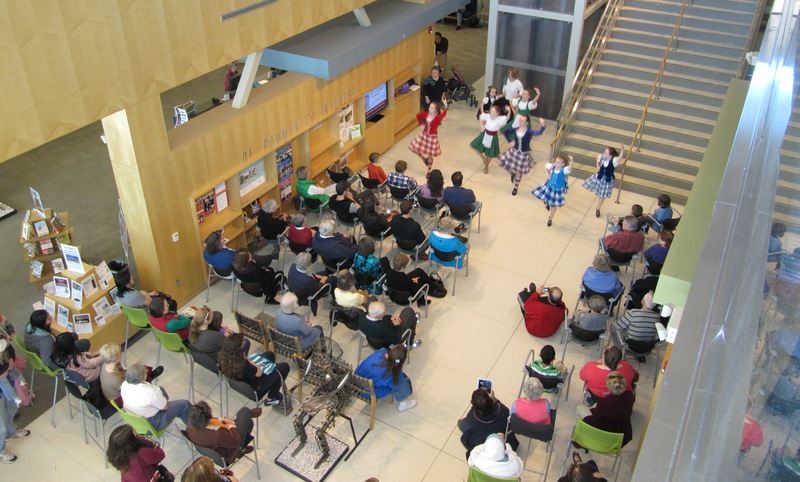 Because North Carolina has a strong Scottish heritage, we decided to highlight King James’s own Scottish heritage in our Manifold Greatness opening celebration at Cameron Village Regional Library in Raleigh, North Carolina. The afternoon began with a performance of highland dancing by the Triangle Scottish Dancers, a local group that is part of the Scottish Cultural Organization of the Triangle (SCOT). Highland dancing differs from country dancing in that the latter is performed by couples who walk around each other in patterns, much like American square dancing. Highland dancing, in contrast, is performed by individuals and involves very intricate footwork. It is similar to the Irish dancing that was popularized by the “Lord of the Dance”. Most highland dance groups are made up of girls and young women, as is the case with our group. More than one attendee remarked on how nice it was to see a group of girls performing together in such an accomplished way. Even the bagpipe player is a teenage girl. After the dance performance in the atrium, the piper played while the dancers led the crowd upstairs to the exhibit room. 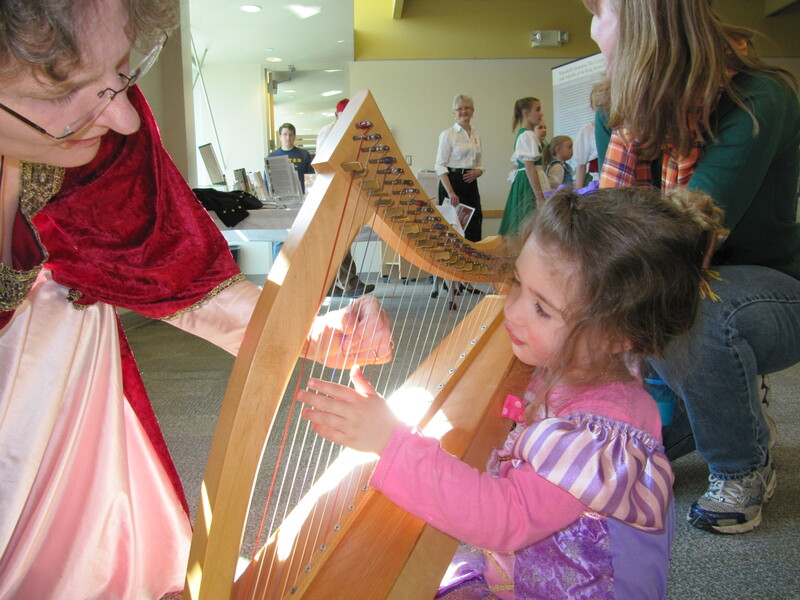 There refreshments were served while North Carolina Symphony harpist Anita Burroughs–Price performed music from the Jacobean era, and told attendees about the history of the harp from its beginning as an outgrowth of the hunter’s bow to the modern harp we know today. 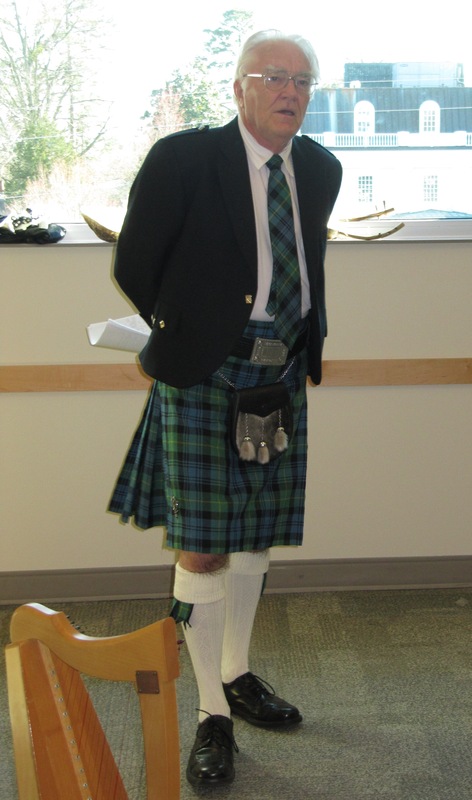 During the harpist’s break, SCOT member George Birrell gave a talk about kilts and read some Scottish poetry. 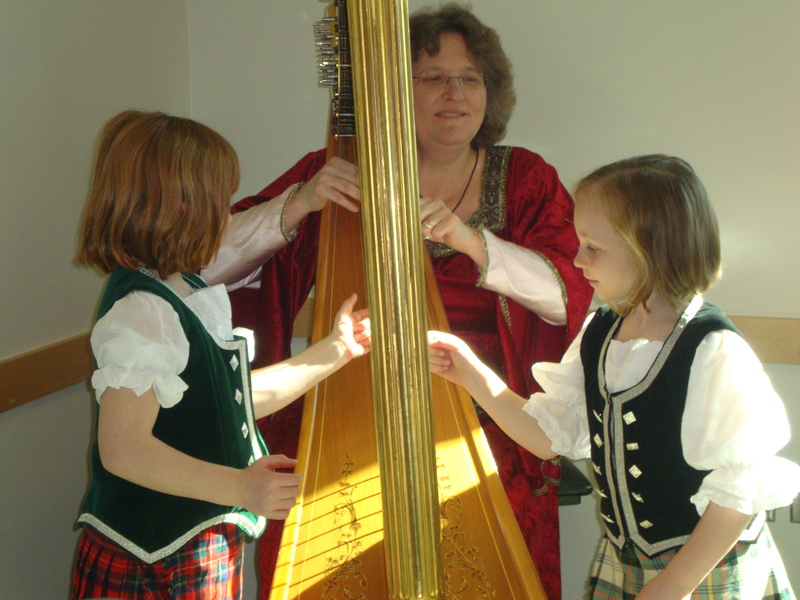 George and Anita then collaborated on an impromptu duet, Anita playing the harp while George recited the words to “Auld Lang Syne,” a Scottish song with words by the poet Robert Burns. An earlier version of the song has been attributed to Sir John Ayton, a scholarly advisor to King James. Sue Scott is Arts and Literature Librarian at Cameron Village Regional Library, Raleigh, North Carolina.